Isoo Backup helps to safely backup Windows including system files, installed applications, boot sectors and customer settings to one image file so that you can restore computer when system slows down or fails to boot. Backup all content in system drive, including system files, applications, custom settings and files required for the computer to boot. Safely and easily restore whole system to a fully functional state when Windows slows down, crashes or infects virus. Quickly back up Windows, system settings, installed programs, boot data and individual files with ease. Create an image file to keep everything for current system and store it to a secure destination in case unexpected disaster happens. Restore your computer to a previous backed state instead of reinstalling Windows, which is the best way to return things to normal when computer cannot boot. Multiple restore modes are provided to ensure operating system can be restored properly under any circumstances. Partition backup is to back up any partition you select to an image file and store the image on either local or USB disk. In the event of data loss such deleting, formatting, virus attack, etc., you can easily restore whatever you need from backup. Isoo Backup always gives you the confidence that Windows is backed up quickly and securely. A complete and effective system backup helps to keep Windows under control, as it is able to protect computer against the risk of vulnerability, system crash and virus. 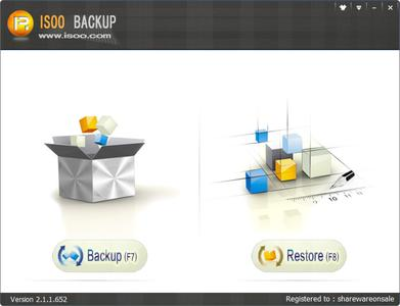 Isoo Backup focuses on simplicity and it is designed with friendly GUI, and only a few clicks can complete Windows backup or restore. Users are guided through all needed step by the intuitive wizard with intelligible and accessible options. No need for IT knowledge background. Forum Saati: 08:20 AM. Zaman dilimi GMT +2 olarak ayarlanmıştır.